QUESTION: My refrigerator is constantly running. The fridge is 5 years old and in good condition. The refrigerator runs more in warmer months. What can cause my refrigerator to run constantly. ANSWER: If your refrigerator never stops running in warmer months, this may mean the refrigerator is in direct sunlight or the room is warmer than usual. Dirty condenser coils can mean the refrigerator runs even longer when the weather is hotter. Drape the windows, turn the AC lower in the room the refrigerator resides, and clean the condenser coils with a wand vacuum cleaner. If you still have issues, see the other reasons below. What simple reasons cause a refrigerator to constantly run? 1. The refrigerator is in direct sunlight. 2. Refrigerator is operating in a warmer temperature environment. 3. A load of warm food was recently added. 4. The refrigerator door is opened frequently. Note: A new refrigerator can take up to 24 hours to cool down. How long does an average refrigerator run each day? A refrigerator will run 35% to 85% of the day during normal room temperatures. If the refrigerator is in a warm room, it may run even longer to keep the temperature cool. What technical reasons cause a refrigerator to constantly run? The following parts/methods to fix a constanly running refigerator are the most common technical reasons. Checking these areas or parts of your refrigerator will help you repair your refrigerator issue. A refrigerator needs proper airflow. If the condenser coils have dirt and dust buildup, the fridge cannot cool down properly. Condenser coils remove heat from the fridge as the refrigerant flows through them. When coils are dirty, the refrigerator will constantly run to attempt to cool down. Clean the coils under the fridge to stop it from constantly running. How to clean fridge coils. This electronic or mechanical timer starts the defrosting cycle. If this part fails the defrost heater does not turn on and frost is not melted. The ice buildup prevents proper air flow. If ice builds up, the refrigerator will constantly run. This timer can be manually advanced by turning a screw in the center of the timer with a screwdriver. The defrost timer can be tested for continuity with a meter. How to test a refrigerator defrost timer. A faulty fridge defrost heater will cause constant running. A refrigerator defrost heater melts ice that gets on the evap coils. If the fridge defrost heater is bad, the evaporator coil will build up ice. When ice is on the evap coils, the fridge will run longer. Test the defrost heater for continuity using a meter to check if faulty. How to test a refrigerator defrost heater. A bad fridge defrost thermostat will cause constant running. This part works with the defrost heater. The defrost thermostat senses the coils are cold. This thermostat turns on when the coils are cold. If the thermostat is faulty it will not melt the ice on the coils. When frost builds up on the coils, the fridge will run constantly as the air cannot flow properly. Test the thermostat for continuity when it moves into the low temp setting. How to test refrigerator defrost thermostat. Freezer temp causes problem with refrigerator. The refrigerator will constantly run if the freezer temperature is above the 10F mark. Set the temperature setting of the freezer to 0F to 5F so the refrigerator can work properly. Clean the condenser coils and check that the condenser fan is operational. If ice is present on the evaporator coils, the defrosting system may have an issue. What other technical reasons cause a refrigerator to constantly run? NOTE: Certain refrigerators may have different parts when comparing older and newer models. Some parts listed on this page may be found only in certain model refrigerators. Check your refrigerator to see which parts your particular refrigerator has. See the owners manual for part lists and electrical diagrams. 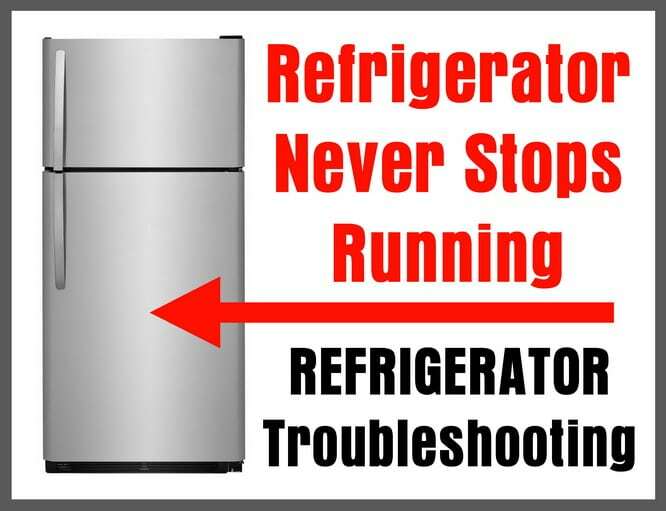 If you have suggestions on other ways to fix a refrigerator that never stops running, please let us know by leaving a comment below. Also, if the above solutions did not fix your refrigerator, let us know by leaving your question below and we will help you get your fridge working properly. Previous post: Bad Smell From Central Air Conditioner – What Causes Moldy Smell?